Fly with the Hot Air Ballooning professionals. View our Hot Air Balloon Flight Locations. 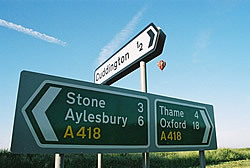 Our hot air balloon rides take off from launch sites in Oxford, Great Missenden and Aylesbury and sites in and around Henley Upon Thames, giving you fantastic coverage of our flight area over Oxfordshire and Buckinghamshire. We regularly see all of these towns from above, giving us a bird’s eye view of the beautiful architecture and history of these ancient settlements. From your hot air balloon, you will be guaranteed amazing and serene views of some of the most fantastic scenery in central and southern England, along with bustling Buckinghamshire and Oxfordshire towns, romantic villages, winding rivers, and some of the most impressive properties and estates in the entire country – our hot air balloons often fly over Waddesdon Manor, which used to be home to the Rothschild family before it was handed over to the National Trust to become one of their most popular properties. It is an extraordinary sight from the basket of a hot air balloon. We regularly also see Chequers, the Prime Minister’s residence, from above, and often see Canary Wharf and Wembley Stadium in London. We fly in the area where aviation first began in the UK, and you will be following in the footsteps of the very earliest pioneers of flight when you take a ride with us. 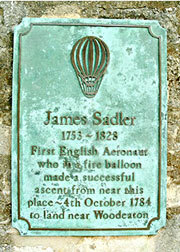 The first ever manned hot air balloon flight in England took place from Oxford in 1784, when James Sadler flew a "fire balloon" 6 miles from Christchurch Meadows to the village of Woodeaton. There is a plaque commemorating his extraordinary feat in Oxford town centre – a good stop-off after taking a flight with us! Click here for a brief history of ballooning.